Under our “European Archaeology Skills Exchange” EASE project, participants will be applying for a grant which will go towards the costs of the placement. Successful applicants will have the cost of the accommodation part covered by the grant. Participants will need to budget for food (will be different per week depending on country chosen) and arrange and fund their travel. If there is any change to this, it will be indicated next to the placement. We might be able to fund placements to other European destinations (other than the Partner we usually work with) as long as the duration of the placement covers 60 days (min.) and the applicant studies or recently graduated at one of our Consortium Partners (University of Bristol, Kent, Chester, Warwick, Exeter, Bournemouth, Glasgow and University of Wales Trinity St David Royal Carter). If you do not see your university listed, please contact us. We are currently organising some other opportunities for archaeology related students/graduates to go and spend 8 weeks doing post excavation work with a few of our partners (Romania, Cyprus, Bulgaria). Please read through the details below (will be updated once things are confirmed) and contact us if you are interested. We will also be advertising the placements on our Facebook page. 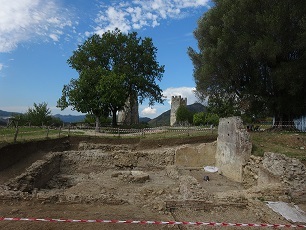 This placement will see the group working with the host, Etruria Nova, at their site in Policastro, situated in Southern Italy. 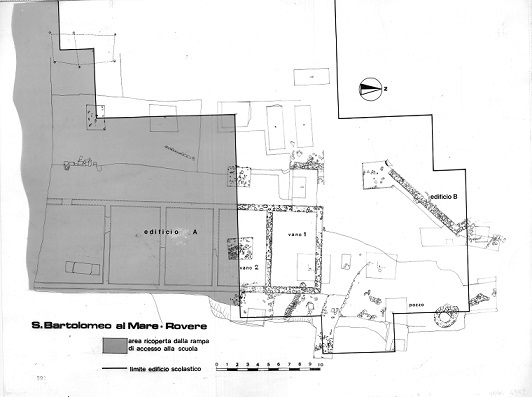 The group will be working alongside the Etruria Nova team in their fieldschool, contributing to the continued excavation of this site. More information about the site can be found in the download available at the top of this page. 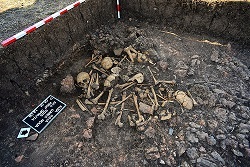 In addition to the excavation itself, the group will be able to choose to work some of the time in the post excavation laboratories that are being set up nearby. These will include a pottery lab, metal lab, archaeozoology, metal lab or working on the wall stratigraphy. Participants will make their choices upon acceptance to the placement. 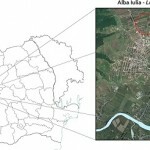 An opportunity for a group to go and work with Dr Mihai Gligor, PhD, Head of the History, Archaeology and Museology department within “1 Decembrie 1918″ University in Alba Iulia. 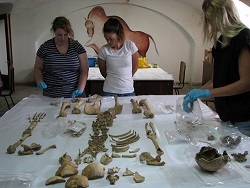 The group will assist staff in analysing the human and pottery remains that have been found over the years. 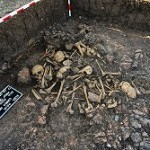 Ideally for forensic anthropology students, this is an 8 week practical placement that will see you working and contributing towards the work of the university. There will also be the chance of working on a rescue excavation during the 8 weeks, details still to be confirmed, so there will be a mix of excavation and post excavation work. 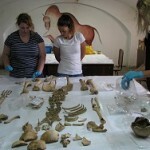 There is more information about the site on the PEATS Romania page. The Erasmus + grant will cover accommodation, participants will have to fund their food (about 70 Euros per week) and sort out their flights, ideally to land on the same day for airport transfers. There are now flights available to Cluj from Birmingham, Liverpool and Sheffield/Doncaster in addition to Luton. Participants will be accommodated in a self catering flat situated within walking distance from the university. The working programme is Monday to Friday, with weekends free to explore the surroundings. It is possible for some of our partners to host some staff visits as well. Alternatively, we are happy to discuss the possibility of funding a placement to a different partner staff already have a connection with. If any staff are interested, they are welcome to contact us to discuss the possibility.